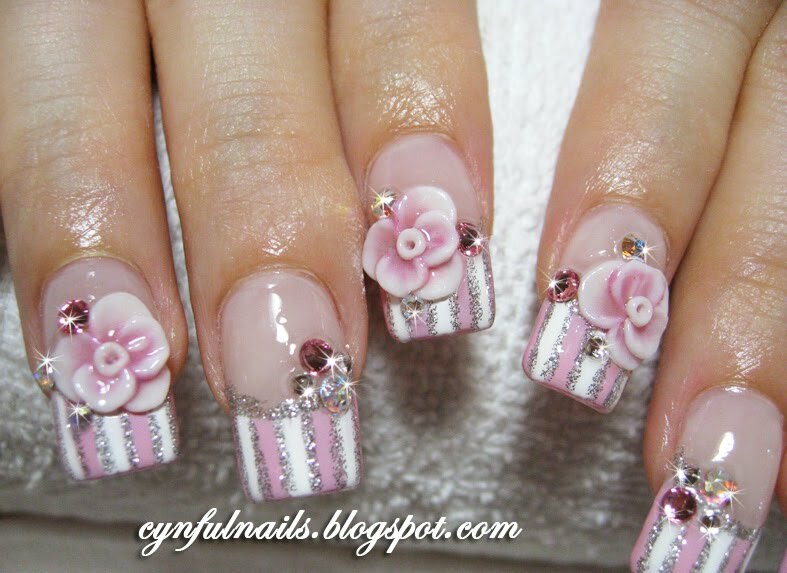 Cynful Nails: Pink acrylic nails. First I must apologise to this lovely lady cos I took forever to send her her nail pics! Sorry girl! There you go! She did her first set of acrylic nails with me during Jan and have since infilled twice. I didn't take pics of her first set of nails cos it was pretty simple. Pink glitter with crystals. Her first infill, she decided that she wanted bows and this is what I designed for her. A design suitable for first timers and those who love pink and bows. Her second infill. She came back 1 month later, nails grown. So... it's near impossible to keep her pink glitter cos nails are filed down n trimmed to a shorter length. A design she chose from my archives. Painted pink and white stripes, silver lines to enhance the design. To complete the look, I finished it off with some roses and crystals. Lovely eh? And totally can't tell that it's been infilled. Twice.